The waterfall catches your attention on arrival in Lauterbrunnen,Switzerland. A 974-foot stream of water gushing forcefully down a cliff in the middle of town, just yards from shops, restaurants and hotels, isn’t your usual scene. But it’s a common occurrence in a valley known for its 72 waterfalls. 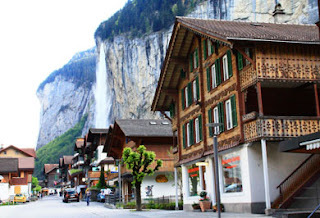 First measured at “900 barn stories” in 1776, Staubbachfalls is the iconic landmark of Lauterbrunnen, a cozy town in the Jungfrau region of the Swiss Alps (elevation 5,300 feet). It doesn’t take long to realize the impact of mountains and water on this region, especially during the season of snowmelt. 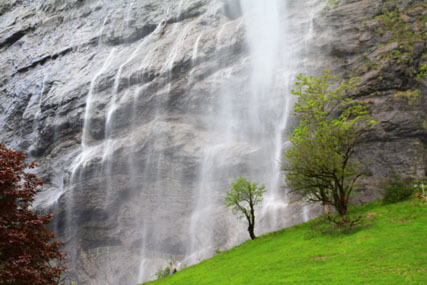 Staubbachfalls disperses glacial melt from Eiger, Monch, and Jungfrau mountains, all outstanding ski destinations that bring tourists here in winter. But spring and summer provide an incredible palate of colors and textures with wildflowers blooming and the sounds of rushing water irrigating the valley always in the background. Each time we walked to Staubbachfalls from Hotel Silberhorn, our Lauterbrunnen home for three days in May, brought a different view. One windy day, the usual strong vertical stream of water dispersed into a heavy sideways spray dampening a wide expanse of rocky mountain face. Access to the waterfall is open from June through October. You can walk up steps, sometimes wet and slippery, and get close enough on a breezy day for the cooling spray to drench your body. When the air is still, you’ll have an amazing view of water plunging downward almost 1,000 feet into the river below. 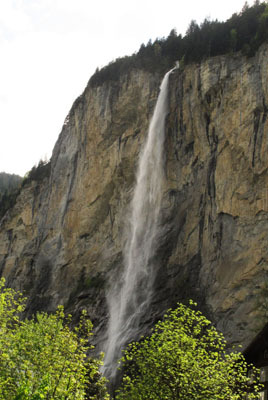 But, even from the ground, Stabbachfalls is a special attraction for visitors.